What are the different types of paprika ? Paprika comes in a variety of styles and flavours, Spanish or Hungarian, sweet, hot or smoked; so what are the differences between the different types of paprika, and when do you use each one ? To start with, what is paprika ? Paprika is simply capsicums dried and ground into a fine powder, but like any spice paprika comes in a variety of different types and grades. Firstly, the type of capsicum from which the paprika is made is one of the primary determinants of flavour. Sweet paprika, or dulce paprika, is made from capsicums that are mild, and this paprika will impart a warm mild flavour to your dish. Hot picante paprika on the other hand is made from hot peppers possibly with the seeds ground in to give it a real kick. Depending on your heat preference, sweet and hot paprika can be mixed in different combinations to give just the right balance of heat for your dish. Hungarian paprika is typically sun dried and is not smokey. Spanish paprika, also known as pimenton, is quite different in that it is dried slowly over a wooden fire giving pimenton a unique warm and woody taste when compared to its Hungarian cousin. Different types of paprika can be smoked differently, so different brands can exhibit quite different flavours depending on how exactly they have been smoked and over what sort of fire. One of the key things to remember when cooking with paprika, is that paprika releases its flavour with heat, yet it burns easily. So it is important to mix your paprika with liquid when cooking, and heat it hot in order to release its flavour. Simply sprinkling paprika over the top of your food will lead to a bland and disappointing taste. It is important that it is cooked into the food as part of the preparation. Paprika is always purchased powdered, and for this reason can lose its flavour relatively quickly if it is left on the shelf once opened. So be generous with paprika, and use it liberally adding a little bit to every dish you cook in order to give a unique, warm, and complex flavour. Always buy paprika in a resealable tin rather than in a plastic sachet, and this will help keep your paprika fresh and potent for the maximum length of time. Our Antonio Sotos paprika is authentic Pimenton sourced directly from Antonio Sotos in the heart of the La Mancha region of Spain. 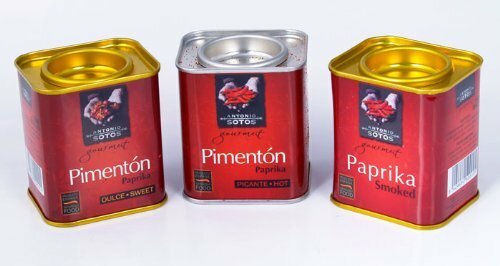 As well as producing the finest quality Spanish saffron, the Antonio Sotos company produces and exports the highest quality Spanish Pimenton and we are very proud to offer Antonio Sotos premium quality Spanish paprika to our Saffrondust customers. Tell us what you love about paprika ! » Why Buy Saffronia Tablets for $40 when you can buy real saffron for less ? » The Half Price Paella Spoon offer is back with any Paella Burner purchase ! » Can I cook paella on an induction stove or cooktop ? » Where can I buy Saffron Tea in Australia ?